Whisk peanut butter with lime juice, Chili sauce, soy sauce, honey, oil, ginger and garlic until combined; set aside. Season wings all over with salt. 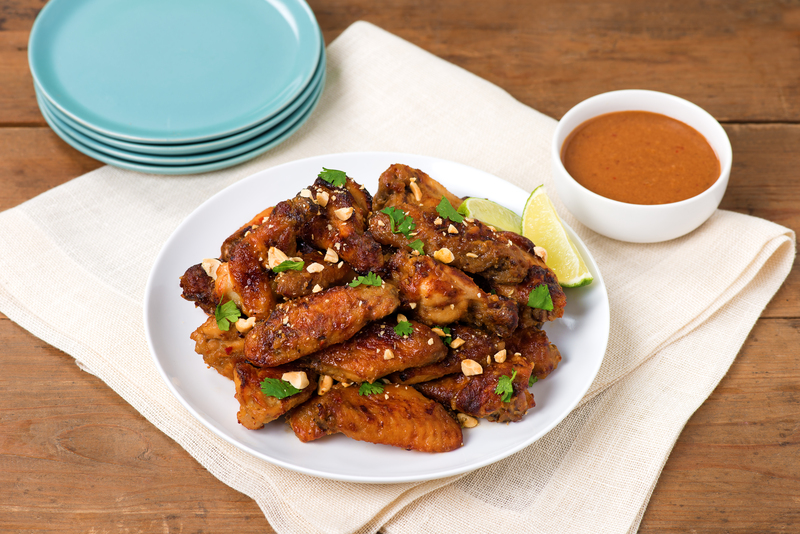 Toss wings with half the marinade to coat. Marinate, refrigerated, for at least 1 hour or up to 24 hours. Reserve remaining marinade for serving with wings. Preheat oven to 425°F. Line baking sheet with foil and generously spray with cooking spray. Arrange wings on prepared baking sheet. Bake wings, turning occasionally, for 40 to 45 minutes or until cooked through and golden brown. Toss in remaining sauce. Garnish with chopped peanuts and cilantro. Serve with lime wedges.